Find hotel near Restaurant Cafe In De Waa .. 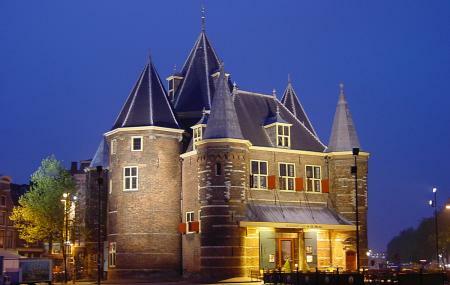 Restaurant Café in de Waag is possibly the best restaurant in the destination if you are looking for a hearty meal at a price that won’t hurt your pocket. Visit the restaurant as it comes highly recommended by tourists and locals alike. The restaurant is famed for its savory food pallet and scintillating drinks menu. So if you are a foodie then visiting this place becomes a must. Nieuwmarkt, Amsterdam is the closest subway station. How popular is Restaurant Cafe In De Waag? People normally also visit Fluorescent Art Museum while planning their trip to Restaurant Cafe In De Waag. People also prefer to start their day with Restaurant Cafe In De Waag. Nicely located in the historic anatomic theater on a central square in the city center. The terrace provides a nice view on bicycle traffic, the occasional market and the bustling everyday Amsterdam traffic, without too many cars around. The food is pretty well done, though vegetarian options are limited. Staff is young and friendly, but the average wait is quite long when the weather is nice. Outstanding place with delicious food and excellent service. The beautiful building makes it perfect for a romantic date. I highly recommend the 3 course package. Service was slow at the beginning, but picked up once the staff realised. After that the service was friendly and punctual, and the food was great! The setting is priceless, and quite unusual for Amsterdam. Hundreds of candles give a unique atmosphere, added to by the building itself and the interior design.